Sudanese Archbishop Paolino Lukudu Loro of Juba presided at a Mass last month where he blessed the tomb of late YCS member Abraham Gajuk who was killed in 1992 during a peaceful protest against forcibly imposed Islamic indoctrination. Archbishop Lukudu urged the Young Christian Student (YCS) to pray for peace in Sudan upon uncertainties surrounding the referendum process. He told the 27 November gathering at a memorial prayer for YCS founders and members killed during the war to invoke the spirit of the decease members to bring peace to Sudan. 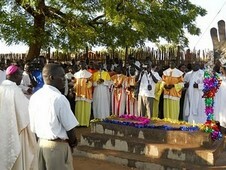 Archbishop Lukudu said Abraham Gajuk and Okela were killed in cold blood in Juba due to their YCS activities. He prayed to the deceased members of the YCS to intercede for peace in the Sudan and called on the youth to register and vote for the referendum in order to honour the blood of their slain members. YCS Sudan is currently celebrating its Silver Jubilee in Juba. The long week celebration concludes on Sunday. There were young people present from most of the dioceses in Sudan, as well as from Uganda and Kenya, Father Herald Joseph Brock CFR noted on his blog. “The event was organized by our friend, Fr. Martin Ochaya Lino, Secretary General of the Archdiocese of Juba and chaplain and former member of the YCS,” Father Brock wrote. “I was asked to address the participants on the theme, ‘A Personal Relationship with God.’ The youth were very attentive and responsive. “The YCS event was co-sponsored by Catholic Relief Services (CRS) with the assistance of another good friend, Tom Purekal, CRS Peace Building Program Coordinator for South Sudan,” Father Brock noted.